Another GORGEOUS website is live! 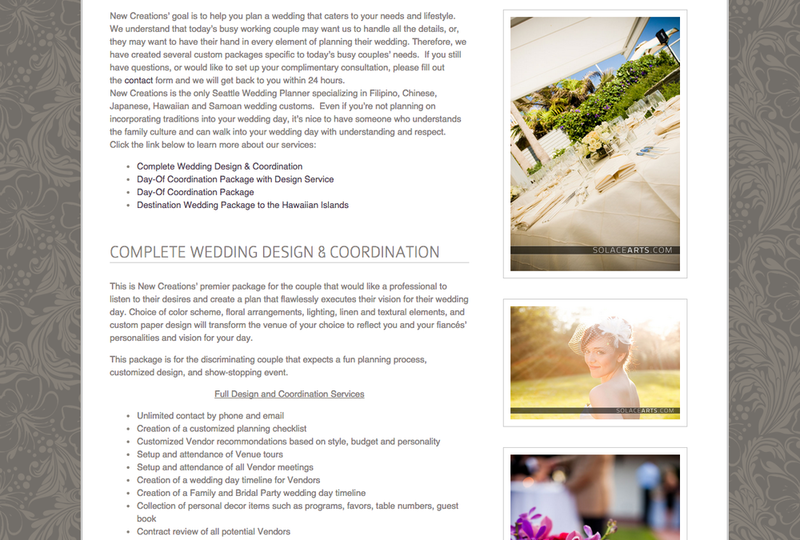 And this one needed it especially for the purposes of SEO (not to mention an update in their design to make it more current) ... Rebecca, a Seattle wedding designer and coordinator, had a website that wasn't mobile device optimized ... and if you recall my blog post about websites that aren't optimized for mobile devices and what Google would do, you know how important that is right now! 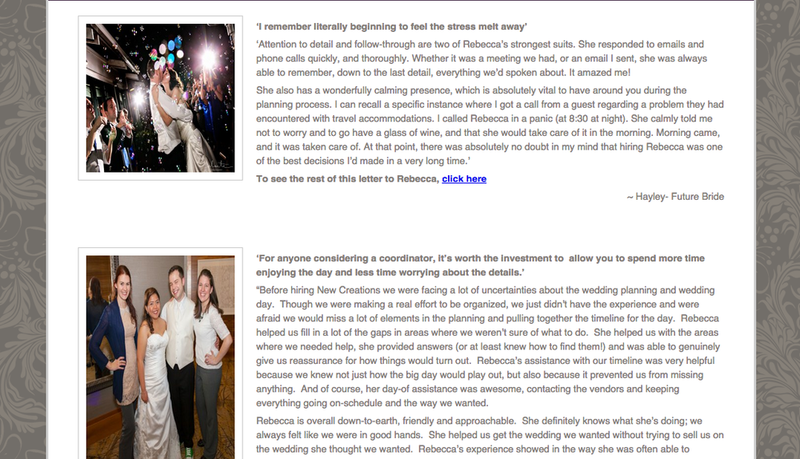 There were key ingredients to designing a new website for Rebecca that I put into play: 1) the galleries needed to SHINE and have enough images to tell the story of the weddings she has planned 2) the galleries needed to be organized in a way that made sense to a planning bride 3) the search engine optimization needed to be done in a way that worked with how a bride planning a Seattle wedding would search. 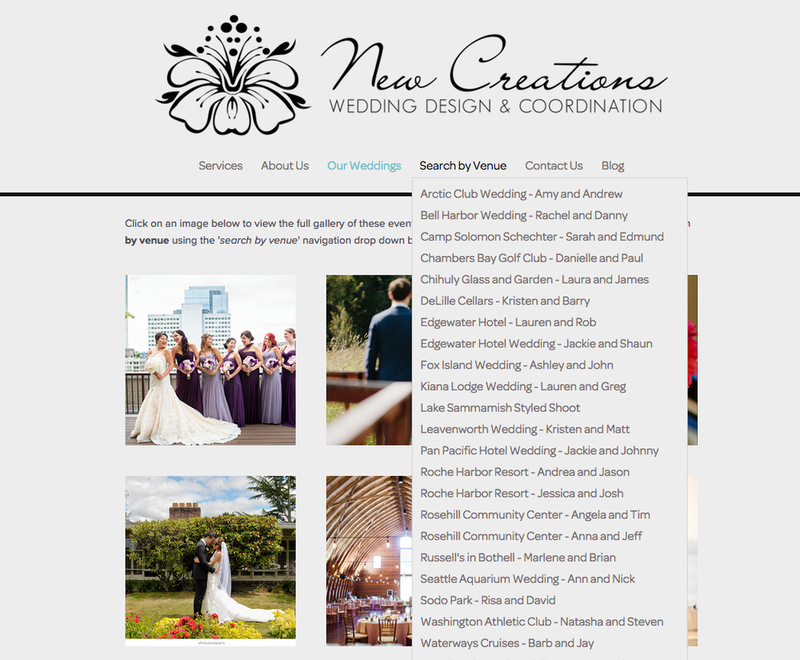 I decided to organize the galleries by a 'venue drop down' search and also include a snippet from each wedding on one landing page ... thus hitting both the 'organized and thoughtful' client and the client who wants to pick and choose from images that are appealing to that particular visitor. I believe I achieved both goals really well with this design. I am THRILLED with how well this website turned out and I believe the change is drastic and noticeable in the best possible way. The new site is clean, organized, has ZERO clutter, and has a user friendly flow that tells a client where they are and allows them to decide where they want to go by 'one click away' options! 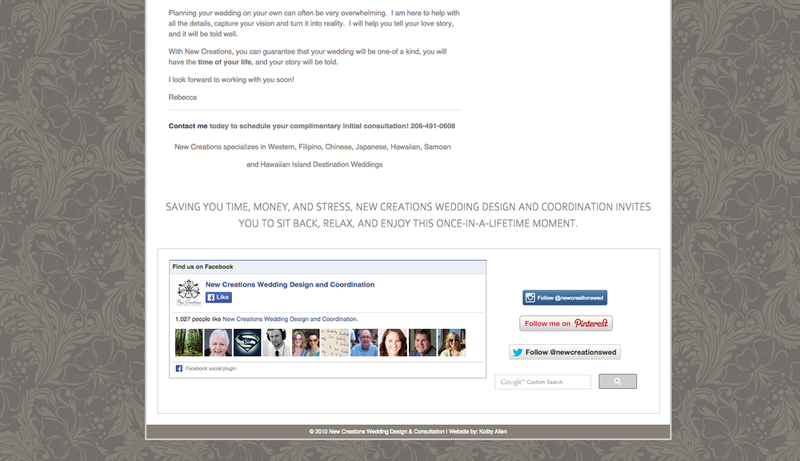 Visit the LIVE site for New Creations Wedding Design and Coordination << there!! What is An Editorial Coordinator? I Love it When Kim and I Make Sh*t Up!